CHICAGO (Bloomberg) -- Volkswagen Group is in talks with U.S. authorities to establish a national remediation fund and a separate one for California as punishment for pollution from its cars after the automaker cheated on diesel-emissions tests, said people familiar with the matter. One fund would be administered by the Environmental Protection Agency and used to promote clean transportation throughout the U.S.; the other would be run by California to promote zero-emission vehicles in the state, said the people, who asked not to be identified because the talks are private. Negotiations are continuing and many details are still being determined, the people said. A deal would help settle a U.S. Department of Justice civil lawsuit and clear a key obstacle as the German automaker tries to emerge from a scandal affecting 11 million of its vehicles worldwide. Volkswagen, which faces billions of dollars in regulatory fines and legal compensation, has a March 24 court deadline in California to present a solution for nearly 600,000 U.S. cars whose diesel engines were rigged to pass emissions tests while polluting more than allowed. Representatives for VW, the EPA, the Department of Justice and the California Air Resources Board declined to comment on the details of the negotiations. 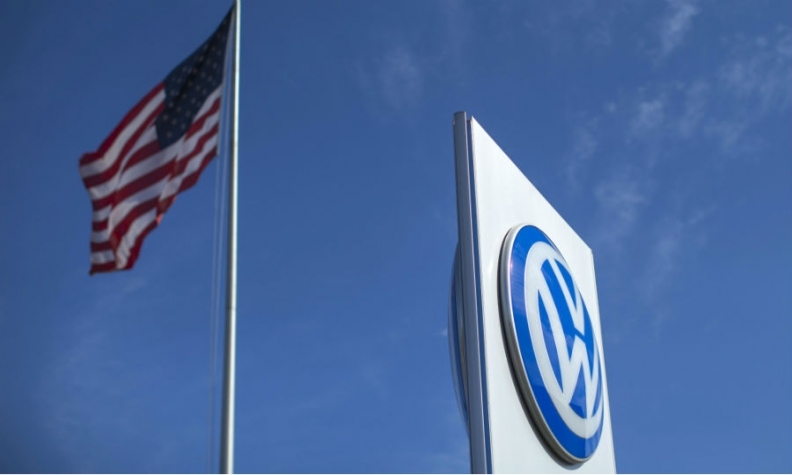 On Jan. 4, the Justice Department sued Volkswagen for violating the Clean Air Act. U.S. District Judge Charles Breyer, who is presiding over the case, has ordered the company to produce a solution at next week's court date in San Francisco. Penalties for the four violations could total as much as $46 billion, according to Bloomberg Intelligence analyst Kevin Tynan, prompting the need to negotiate a deal that would be manageable. A U.S. settlement would add to the 6.7 billion euros ($7.4 billion) that VW has set aside for the scandal, including repairing 8.5 million vehicles in Europe. The Justice Department's process is similar to its civil suit against BP after the 2010 Deepwater Horizon offshore oil spill, a department official who asked not to be cited by name because of the active litigation has said. In BP, the U.S. coordinated its case with those by private plaintiffs. The government has linked its case against Volkswagen with consumer suits and those filed by several state attorneys general that are now before Breyer. The department is separately investigating whether Volkswagen or its executives violated any criminal laws. Talks between U.S. authorities and VW were complex and started slowly as the manufacturer initially denied any wrongdoing and then went through a series of changes in leadership and legal advisers, said the people. Negotiations over solutions started to make progress only in recent weeks, they said. Francisco Javier Garcia Sanz, Volkswagen's head of purchasing and the longest-serving member of its management board, took control of the talks from technical staff in December. Settling the Justice Department's civil lawsuit will include the two mitigation funds and agreements on plans to reduce nitrogen-oxide emissions from vehicles that remain on the road, the people said. In bargaining so far, U.S. and California officials have insisted that any settlement give all customers the right to sell their cars back to Volkswagen, if they want to, said one of the people. While VW has said buybacks are a possibility, fixing the cars is the company's preferred option. In cases where durability of emissions controls is a concern, the government may require Volkswagen to expand its warranties and replace catalytic converters or other equipment every 25,000 miles, said John German, co-lead of the International Council on Clean Transportation. The ICCT is a nonprofit group that helped expose Volkswagen's cheating last year. Progress has been made toward agreeing on a new engine-control software and hardware to lower harmful emissions, according to the people. But it's unlikely that a breakthrough resolving all the technical questions including hardware fixes can be reached by next week. "As of today, we do not believe any of the three generations of vehicle technologies for the 2.0-liter vehicles can be repaired to meet their certified emissions levels," Todd Sax, chief of the California board's enforcement division, said last week at a state Senate Environmental Quality Committee hearing.